All but the sweet solicitudes of love! To point each glance, and force it to the heart! Alas! ’tis hard for beauty to be just. So shall Belinda’s charms improve mankind. p.s. 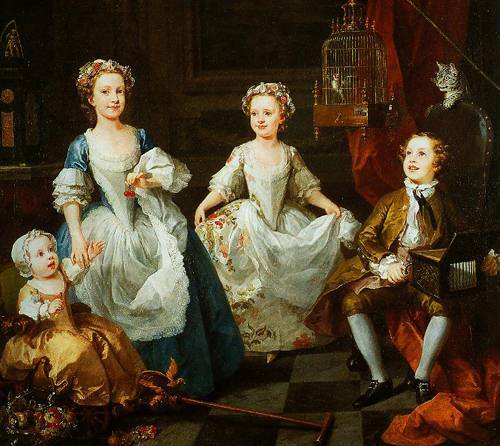 Painting by Hogarth, The Graham Children. I have three daughters and one son, just like the Grahams, except my son is the youngest. The cat looks suspiciously like ours, as well. This is actually a very sad painting because the baby had died by the time Hogarth painted it. But I meant for it to be a happy image, and I’m certain Hogarth did, too, in his attempt to capture the joy of the moment. What a smart aleck. Do you not know that 'no comment' is a quite expressive opinionative reply? Uh, why yes, anon, I think I picked up on the opinionated part. did you now? excellant, I'm sure. I admire your kind gift to your daughter on her birthday. Do you think she like the poem? Yes, I think she indeed appreciates the sage advice of Dr. Samuel Johnson. She wants to learn to be more than just a pretty face with a coquettish smile–even though she is quite good at charming others w/ her charms. "charming others w/ her charms." Um, yes, that's what you do w/ charms, isn't it? Do you find her…charming…? and what is her charm? Her great beauty, of course! And her enthusiasm and zest for life!